Absolute Carpet Care Offer Upholstery Cleaning Services For Homes, Offices, Cars, & Even Boats! In addition to our carpet cleaning expertise we are highly experienced in the cleaning of lounge chairs, dining and office chairs, mattresses, cushions, car upholstery, 4WDs, caravans, boats, motor homes and everything else. We use a powerful hot water/steam extraction system that provides cleaner and dryer upholstery. We also offer fabric protection services to protect your furniture from those accidental spills. 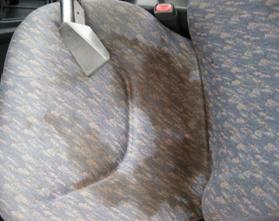 The two images above show before and after shots of a car seat with a large stain on it. 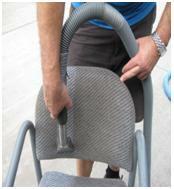 Call 1300 136 365 today to find out more about Absolute Carpet Car’s car seat cleaning services! 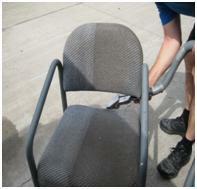 Our upholstery cleaning services are ideal for lounge chairs, office chairs, mattresses, cushions and car seats. Pre-inspection and a spot & stain survey. Professional advice and evaluation of your upholstery. Powerful equipment delivers more vacuum, resulting in cleaner and dryer upholstery. *Some stains require additional charges and prices are subject to change. Minimum charge applies. For a more precise quote, fill out our Free Quote Form today! Service to protect your furniture from those accidental spills. No job is too dirty for Absolute Carpet Care! Call us today on 1300 136 365 or fill out our Free Online Quote form! Pre-inspection and spot & stain survey. Professional advice and evaluation of your verticals. Petra Tech V6000 gently agitates, washes, rinses and extracts. 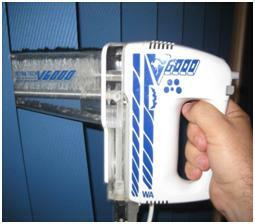 Carefully dry any spilled moisture on window sill or sliding door track. Our vertical blind cleaning system is ideal all windows, from the smallest domestic window to larger, commercial and retail windows. Prices for vertical blind cleaning start from $22.00 per window. Prices subject to change and a minimum charge applies. Phil demonstrating how the Petra Tech V600 Blind Cleaning Machine works. 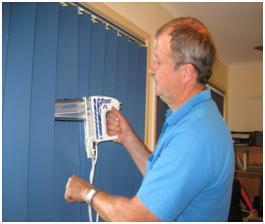 For more information about our Brisbane vertical blind cleaning services, call us today on 1300 136 365. To recieve a free vertical blinds cleaning quote, fill out our Free Online Quote form.